This car has some strange history as a Grand Prix racer turned Indianapolis 500 winner—except that it isn’t. As part of Bonhams’ Bothwell Collection sale yesterday, this 1914 Peugeot L45 Grand Prix Two-Seater ranks among the most expensive French cars ever sold (some Bugattis and Talbot-Lagos have exceeded this number), and among the highest we’ve ever seen paid for an Indianapolis Roadster. If there was a car to throw that kind of money out for, it might be this one, due to its historical significance and quality presentation. Since the 1940s, this car was believed to be the one that Dario Resta drove to victory at the 1916 Indianapolis 500 Mile Race. While it is fitted with the L45 engine that it would have used in earlier iterations of the race, this car actually raced with a 3.0-liter in 1916. A full century later, we now know that this was actually the car which Ralph Mulford drove to third place that year. Close, but no milk. 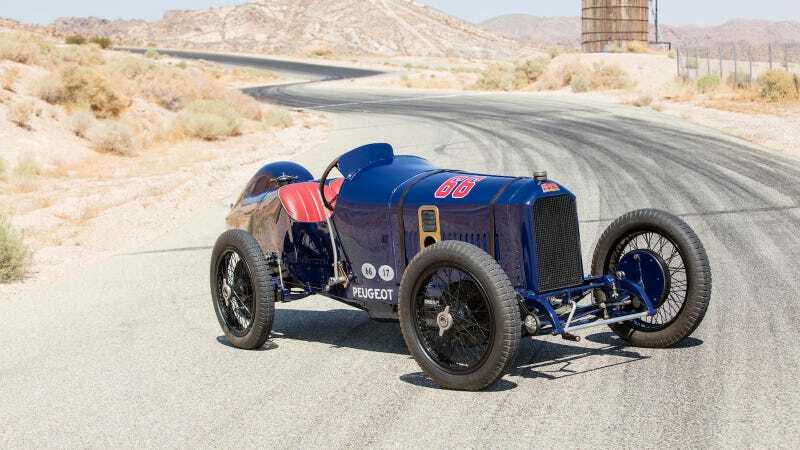 With just shy of 4.5-liters of displacement, 112 horsepower, and four-wheel mechanically-actuated braking, the French managed to dominate Indy for a few years in the early teens. Jules Goux was the first non-American to win the Indianapolis endurance race in 1913 in a similar car, and with lap speeds approaching 90 miles per hour, these cars were absolutely flying. Back then, the winner of the race was awarded a massive $20,000 first prize. Over a century later, this car, which didn’t even win the race, sold for over 360-times that at auction last night. To see a lot more photographs and read more about this phenomenal Indy winner, you can check out the full listing over at Bonhams.com. A few Bugattis and Talbot-Lagos have exceeded its sale price, but it’s still one of the most expensive French cars ever auctioned off. While most of the collection sold in the tens of thousands per lot, the Bothwell collection also housed a 1908 Mercedes-Simplex 65HP Raceabout which sold for just over a million, and a 1908 Benz 105HP Prinz-Heinrich Raceabout, which sold for $1.87 million.